While taking photos in El Cap meadow today we heard the cry of a climber on The Nose taking a fall and clearly getting hurt. Within minutes an emergency call was out and the Yosemite Search and Rescue team moved into action. Over the next few hours we watched YOSAR work the scene, culminating with a dramatic helicopter rescue of the injured climber. The climber sustained a broken femur and was traction-splinted on the rock face prior to being short-hauled off the cliff. The climber apparently lost control seconding the pendulum off Sickle Ledge moving up to Dolt Tower, and slammed into the corner. The helicopter flew in close proximity to the wall initially to read the situation. It returned a short time later with a ranger taking the best ride in the park beneath the helicopter and being dropped off with the victim to deliver treatment and stabilise the situation. A second ranger was flown in with more equipment and the stretcher necessary to evac the climber to safety. The climber was landed in El Cap meadow and transferred to another chopper to be flown to hospital. The rescue was efficiently and skilfully performed, and was one of the most dramatic events I’ve witnessed. 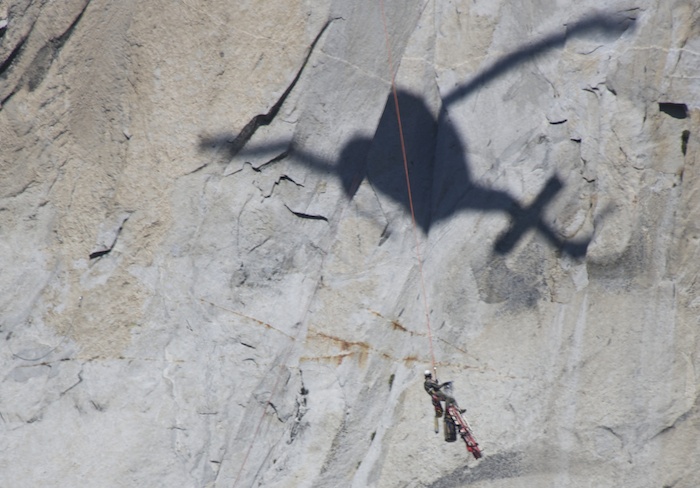 We captured all the drama of this rescue and have presented it a Yosemite Rescue Gallery. Please take a look and marvel at the skill of the YOSAR crew.